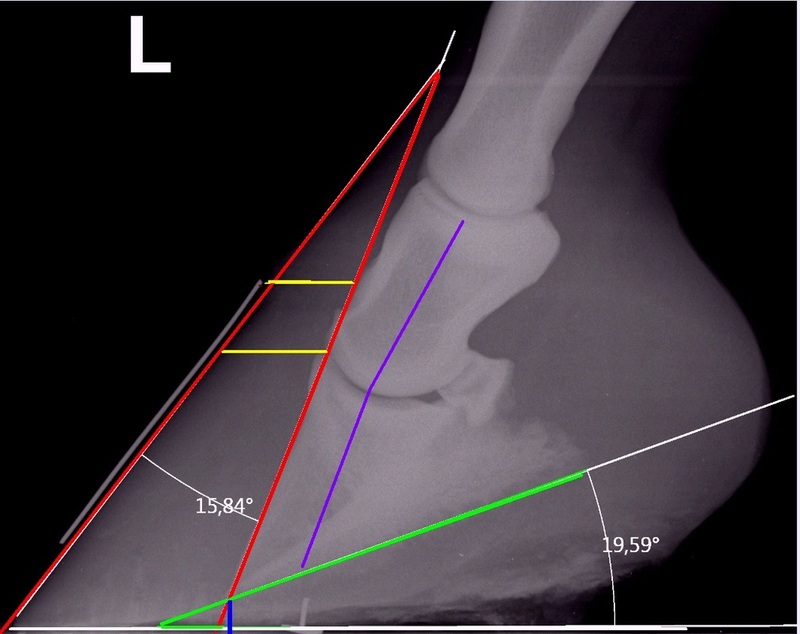 X-rays (radiographs) are essential when a horse has or has had laminitis, to assess changes in the feet and guide realigning trimming - a latero-medial view of each affected foot is often sufficient; a 0 degree dorso-palmar view helps assess medio-lateral balance. 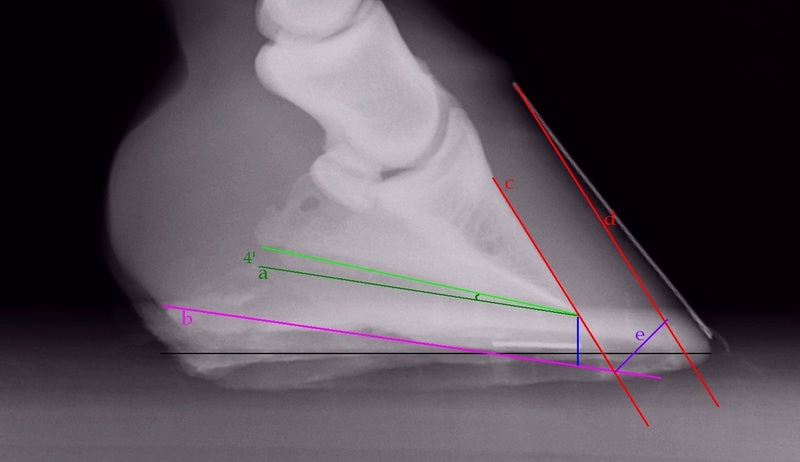 X-rays and realigning trimming should be carried out as soon as possible, as misalignment of the hoof capsule to the pedal/coffin bone and separating forces on hoof walls are likely to increase pain. Red - dorsal angle 15.84 degrees. Green - palmar angle 19.59 degrees. Blue - very little sole depth. Yellow - reasonable sinking. Purple - some bony rotation. No obvious gas pockets. Red - dorsal angle 9 degrees (should be 0). Green - palmar rotation 15 degrees (should be 3-5). Blue - sole depth needs to be developed. Yellow - no significant sinking. Purple - some bony rotation. No obvious gas pockets. - distal descent or sinking - when there is a larger than normal distance between the extensor process of P3 and the coronary band - shown by the yellow lines above. Dorsal and palmar rotation can be corrected with trimming, and distal descent may be corrected with correct trimming over time. 4. develop sole depth if necessary. There should be no dorsal rotation, i.e. 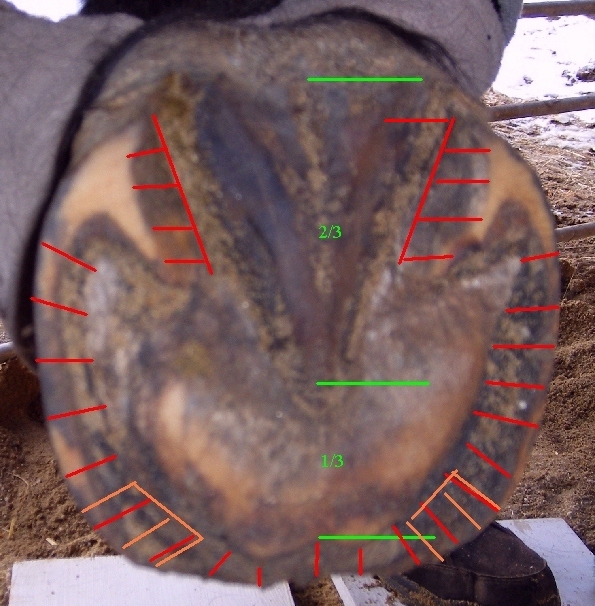 the hoof wall at the toe should be parallel to the front (dorsal surface) of P3. c. A line is drawn down the dorsal surface of P3 and projected to the ground, taking into account the sole depth required - inner red line. d. A line is drawn from the hairline at the toe parallel to the dorsal surface of P3 - outer red line - this is the correct toe. A new tightly connected and correctly aligned toe should grow down from the coronary band as long as breakover is bevelled between the correct toe line and the true edge of the sole (allowing for adequate sole depth - indicated by the point where a line drawn down the dorsal (front) surface of P3 meets the ground) - i.e. between the 2 red lines. Bringing breakover back to or towards the true edge of the sole reduces separating forces on the laminae and reduces any pull from the DDFT. As a general rule, horses with dorsal rotation will be comfortable with breakover bevelled at the outer edge of the true white line, but some may prefer breakover to be bevelled just outside the edge of the true sole (but taking into account sole depth and the need to protect the tip of P3), and others may prefer breakover to be bevelled a little to the outside of the outer edge of the true white line, i.e. with weight being born by the laminar wedge. Where there is an area of separation (gas pocket) on an x-ray, the foot must be rasped so that all weightbearing surfaces are on the bone side of the area of separation, as any surfaces to the outside of the area of separation are not connected to the skeleton and therefore unable to bear weight. Note that when dorsal rotation/laminar wedge are present, what appears to be the white line on the solar surface of the foot will not be the true white line, and therefore this cannot be used to guide the trim. A bevel will normally be between around 30 and 60 degrees (from the ground plane) - the steeper (45-60 degree) angle often being preferred where there is considerable separation/flare. 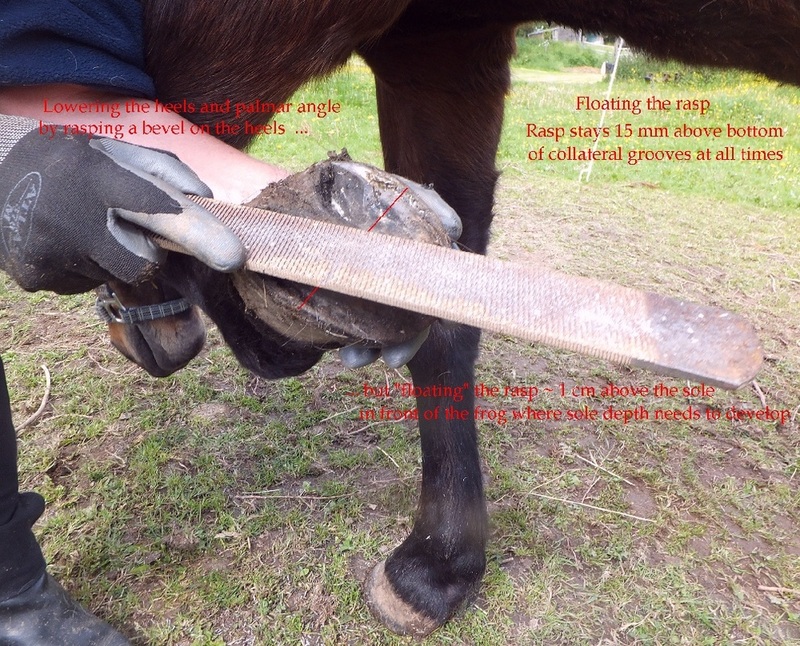 Daisy Bicking in her article Laminitis And The Laminar Wedge: Take It Or Leave It says that "a stable laminar wedge can be treated like wall and should be removed to facilitate reducing leverage of the damaged laminae." Debra Taylor in her paper Clinical Outcome of 14 Obese, Laminitic Horses Managed with the Same Rehabilitation Protocol suggests not rasping hoof wall flares on the outer surface of the hoof "until the new growth of the hoof wall" has "grown at least two-thirds of the distance from the hairline to the ground". A "correct" palmar angle is generally considered to be between 2 and 8 degrees, some suggest a tighter range of 3 to 5 degrees. 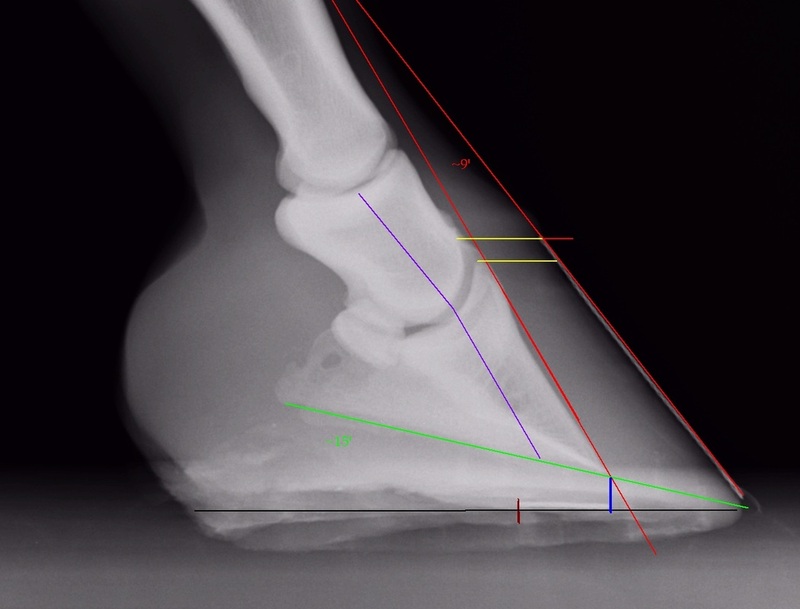 Following laminitis and rotation it is probably best to aim for a lower palmar angle to reduce pressure on the tip of P3, the angle can be increased if necessary once the horse is back in work. a. A line is drawn at 4 degrees (or the desired palmar angle) from the solar surface of P3 - dark green. b. The heel trim/solar plane of the foot is drawn parallel to the dark green line, allowing for reasonable sole depth - pink line (with sole depth marked in blue). Note how the sole will have to develop at the front of the foot to achieve the desired sole depth. 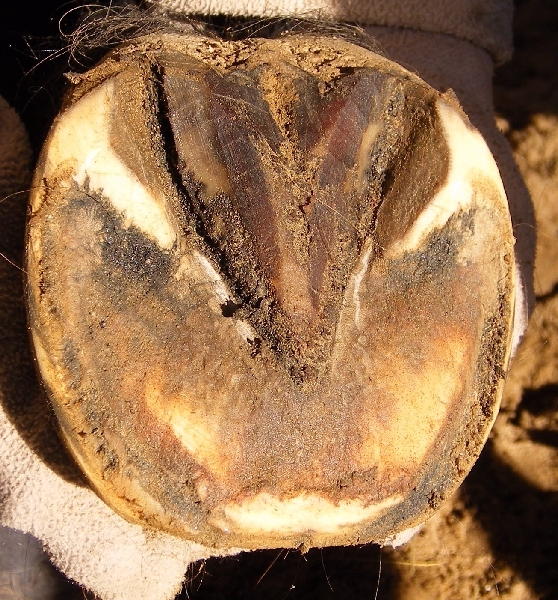 The outer walls should be bevelled almost all the way round the hoof (usually not the heels) - this reduces separating forces on the walls, which are no longer well connected to the bone. The walls should be brought down to sole level so that the walls are weight bearing as little as possible. Some trimmers leave a little more wall at the "pillars" at 10 and 2 o'clock (where the toe is 12 o'clock). Most horses will require boots and thick pads and/or deep conforming bedding for sole protection while the rotation grows out. Before realigning trim - the white line is very stretched showing that the walls are no longer well connected to the bone. The outer walls should be bevelled almost to the outside edge of the true sole, as shown by the red lines. Some trimmers leave a slightly higher area of wall at the pillars - indicated by orange. After realigning trim - the outer wall has been bevelled to just outside the edge of the true sole to reduce separating forces on the walls. Most horses are instantly more comfortable once this is done, as long as pads/deep conforming bedding are used to cushion their soles. f. The area marked orange is sole that must develop beneath the tip of P3 - this area must not be touched with the rasp. To lower the heels (and reduce the palmar angle) but preserve sole depth in the front of the foot, the rasp must be "floated". This will lower the heels at an angle, i.e. with a bevel. The rasp should stay 15 mm above the bottom of the collateral grooves at all times, and should remain at least the height of the extra sole required above the sole. In effect you imagine the foot that you want to develop and rasp this imaginary foot. In most cases this will leave the ground surface of the foot in two planes whilst the sole develops. Horses should be kept on deep conforming bedding and/or in thick pads (12 - 25 mm) whilst their soles are thin, and this will compensate. Floating the rasp appears to be an essential part of the realigning trim in most cases.